Pekanbaru is located at the south bank of the Siak River. 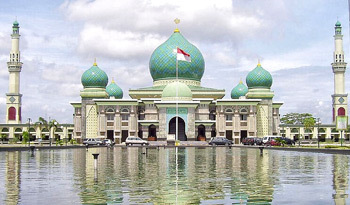 Here, one can visit the Grand Mosque, which is the oldest mosque of Pekanbaru. It has been built in the 18th century during the authority of Abdul Jalil Alamuddin Syah Sultan and Muhammad All Abdul Jalil Alamuddin Syah Sultan of Siak sultanate; the Great Mosque of this kingdom is the oldest mosque in Pekanbaru City. Next to the mosque there are some graves of the royal family. Their graves can be found on the compound of the mosque. Other than that, there is also an old well considered holy and frequently visited by visitors, mainly those who possessed the cultural link with Siak Sultanate, while requesting for blessing and fortune.